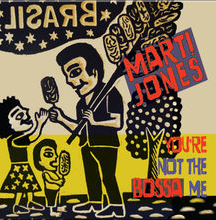 When I saw Marti Jones perform last January, she mentioned she was having a Bossa Nova record coming out in 2014. She played one potential selection, "Keep it to Yourself" and it was nice. But any new music from her is welcome. That said, I want to love this record. But we don't always get what we want. The thing with Bossa Nova is, you really have to want it. Brazilian in nature, it makes for great background music - or evening drinking music - for one or three incredible songs, but rarely does one listen to the genre for a total of 42 minutes in a row. You're Not the Bossa Me attempts the style - which works and doesn't. The songs have the percussion down. Ditto with the horns. The guitars are ok, but not quite authentic, though I don't think they're supposed to be. This disk is heavily Bossa-infulenced, but not down to the letter. It is the vocals with which I have one of my bigger issues. Jones has a great alto. But later Bossa Nova trends (which this disk is emulating) are known for the softer and more subtle vocal palate. Jones meets that requirement, but in turn minimizes and marginalizes her own talents. It really works on a few songs, but then it just falls flat - literally. While I think it's the written music (and not her actual vocals), some of the words land on a flat note. Kelley Ryan apparently / allegedly co-produced with Don Dixon (there was no digital booklet to see the writing / producing / playing credits - which irks me) and her style seems to dominate. Ryan is fine in limited doses, but you hear her in the music (which no doubt she wrote or co-wrote) and inserts herself into the vocals, which far too often. Again, there are a few decent songs, but I won't go as far as to say they're outstanding. I think the biggest issue I have with the disk is that what I normally get out of Jones' music is the ability to to connect, sing along and usually achieve some emotional resonance. I get none of that here. It's light-weight, which is fine for a song or two, but ultimately, they all run together and it's hard to distinguish one song from another. And that's a shame. Bossa Me is Jones' first solo disk since 2002 (and only her seventh since 1985), so prolific she is not. I'd like to hear what she'll do on her next disk, but that could be a decade away. Like something that would play in the background of a slasher flick while a family was getting chopped up by a hatchet.